We’re only 4 weeks into the NFL season, and any preconceived notions you had about how the season would shape up has already been turned on its head (unless you’re talking about the NFC West). In short, the Chiefs are the only undefeated team, and the Eagles hail from Vickadelphia. But does Fantasy (Football) match reality? I looked at one of my leagues to see if points scored was correlated with draft position (through week 3 due to the bye weeks in 4+). For rounds 1-9, there appears to be a distinct, expected pattern. 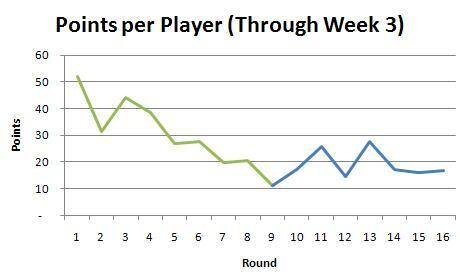 As the round of the draft gets higher, the points scored decreases. 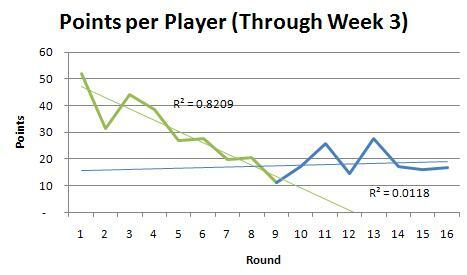 Other than round 2, which appears to be a disastrous round for owners, points scored decreases like an escalator. Indeed, the regression is almost a perfect fit for rounds 1-9. But after that, it’s just random chance. What does this mean for Fantasy Football (and real football for that matter)? You don’t need to be an expert in the early rounds. Just like Mel Kiper Jr. always nails the first few picks, if you go with the consensus, you’ll be in good shape. In the later rounds, look for potential, not history. I always laugh when someone picks up a old-timer like Chris Chambers or Sammy Morris in round 10, leaving Jacoby Jones, Mike Williams, and others with similar potential on the board. Sure, you could end up with a player who is still developing like Mohamed Massaquoi, but you’re no worse off. Measure upside. Use tools that estimate “breakout” potential and put numbers to it. Use that in later rounds to maximize your upside. That’s what the pros do. Sure, sometimes you’re forced to cut your losses, like Mike Shanahan with his 3rd rounder Maurice Clarett, but that’s football. Winning the later rounds is what matters. As the regression graphic shows, there’s no difference between round 9 and round 16. Devoting more time to researching the later rounds will pay more dividends than agonizing over round 1.